The online booking process can vary based on tour length and options. Use the steps below to walk through the booking process. If you need additional assistance, please call our office during business hours. In the tour's Departure Dates tab, select your desired Number of Passengers, then click the Shopping Cart icon next to your desired date. If you're not logged in, log into your account, or select options to register for an account or reset your password. If you do not receive a new password within ten minutes, please call our office and we will gladly reset your password. If prompted, update your contact preferences here. Check the boxes for Mail, E-mail, Telephone, and SMS (text messaging) so that you'll receive exclusive offers, tour announcements, and more exciting travel news. Select the check box next to the names of passengers going on the tour, then click Next. Or, skip this step and add new names by clicking Next. Verify passenger names and information. Cell No. : Cell phone numbers are required in case of an emergency during your trip. Please provide as many cell phone numbers as possible. If a passenger does not have a cell phone, you must check the No Cell box. Special Needs: Use this field to let us know that you have special needs, i.e. bringing wheelchair and need ramp to board bus, or requesting Priority Seating (restrictions apply to Priority Seating requests - call for details). Traveling With: If you are traveling with a person or group who booked separately, please enter their name here. We use this information to do our best to ensure that you will be on the same bus, and have seats together if attending a ticketed event. PLEASE NOTE: Select casino tours also have Just Returning / Not Returning drop down menus. If you are going and returning on the same day, leave these options blank. If a passenger is booking one-way TO the casino, select "Yes" next to Not Returning. If a passenger is booking one-way returning FROM the casino, select "Yes" next to Just Returning. Select your desired pick-up location. If passengers in your reservation will be boarding at different locations, select "No" from the drop down menu and choose the appropriate location for each passenger. Some tours have multiple fares to choose from, based on Child/Adult prices, or seating location at ticketed events. Use the drop down menus to select the number of passengers that apply to each fare (i.e. 1 Adult, 1 Child). 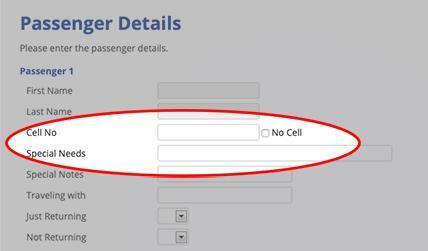 A new drop down menu will appear, and you must select the passenger name that matches the fare. Accept or Decline our Tour Protection (cancellation insurance - see cancellation policy here). Use the drop down menus to select the number of passengers that are accepting and declining the Tour Protection. A new drop down menu will appear, and you must select the passenger name that is accepting or declining the insurance. Carefully review your reservation information. To make changes, click Previous. If the information is correct, click Next. Select your credit card type and enter the name as it appears on the card, and the billing address for the card. Enter your credit card number, expiration date, and 3-digit security code (Card Code). Click Submit. You're all set! Check your email for a confirmation to print and bring with you on the day of your trip. Happy travels!